As a long-time fan, I'd never thought I'd get disappointed by a Running Wild album -- an assumption spectacularly and cruelly shattered by the bomb that was Shadowmaker, a half-baked mess of an album dumped out by the band apparently without much thought or effort. Apparently a lot of fans felt the same way, which makes their latest album, Resilient, something of a test as to if Running Wild, now consisting only of Rolf Kasparek and support guitarist Peter Jordan, still has what it takes to make a good metal album. The results are mixed; even though this is way better than Shadowmaker, it's a more hard-rock-oriented album that is diminished in comparison to the string of past legendary albums Running Wild was known for. Kasparek's significant abilities and the slightly greater effort he appears to have given this album save it from being a total dud, but it isn't great, either. Soldiers of Fortune and the title track are prime examples. Both are decent songs, nice and solid and perfectly listenable, but just sound a little flat. Rolf Kasparek sounds quieter and more nasal, without the echoing, booming voice he displayed for so long -- you can't imagine some of the screams he was capable of in the past on these two songs. Of course, that flat sound is partially because on this album, he opted to substantially turn down the reverb that had characterized their sound since the 80s. That said, his ability to craft a good melody overcomes many objections one might otherwise have; just because Rock'n' Rolf is a bit quieter doesn't stop him from sounding good on both songs. While Adventure Highway sounds pretty formulaic, I still couldn't help enjoying The Drift, a bass-heavy, medium-fast chugger. Desert Rose is essentially a mid-tempo love song, which sounds like it would be Running Wild's lowest point, but in fact, it was one of my favorites on the album. Sure, it's not much of a metal song, definitely going into the hard rock side of things, but the melody is good and Kasparek puts a generous portion of his old vocal fire into something that could very easily fall flat (and I like the way he says "wision" instead of "vision", like Klaus Meine -- without knowing anything significant about the German language, it's impossible for me to tell if it's all Germans pronounce the word this way, or if it's just something German rock vocalists do). If the rest of the album stayed at this quality, this would be passable at least. But Fireheart, Run Riot, and Down to the Wire all seem like a step down, dull and uninspiring in both riffs and chorus, and I can't view these as any more than the album filler they almost certainly are. If the choruses aren't good, one knows one is in trouble, since Kasparek has always had a talent for putting a rousingly melodic chorus on even the weakest of his songs. Crystal Gold, a politically inspired song about the privatization of drinking water, actually demonstrates this skill quite well; the verses are puny, nothing but simple vehicles for the lyrics, but the chorus makes up for them with fist-pumping gusto and almost, but not quite, saves this song. Finally we get Bloody Island, an epic, pirate-themed piece that -- let's face it -- was probably what everyone was hoping we'd get on this album after the horror of Shadowmaker. And clearly this is known, because it is ten minutes long, gets a little bit of extra reverb on it, and has the two-guitar solo tradeoffs the band did all the time in the old days. This is the most metal-oriented track on the album, and though not their best, still feels stronger than most of the more hard-rock tracks. 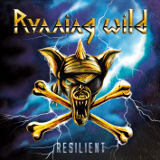 Resilient is mostly listenable, especially the first few tracks and the final one, but it appears that so far, even someone as legendary as Rock'n'Rolf can't carry the Running Wild sound on his own. There's nothing spectacular about Resilient -- it's better than Shadowmaker and that's about it. Fans may want to check this one out, but the sound is simply flatter and tamer than in the old days, a whimper rather than a bang, which makes this one nothing but an echo of what preceded it.